You are currently browsing the category archive for the ‘Global Trade’ category. THEN, there are days everything changes. Right now, we have the WEIC bills shuffled into a different committee in the Senate, creating speculation they may be shelved, never to see the light of day. They passed the House. This is important for all of Wilmington. I was telling some school kids what it was about, and their eyes got HUGE! (They had no idea)… But it is the first change in New Castle’s School Districts boundaries since the famous Court desegregation settlement. It has great impact on property values in Christina District… Woo Hoo! No more thugs! That becomes the place to raise your kids. Red Clay’s housing prices begin their grand longterm slide… Pike Creek is a great neighborhood, but we now got thugs from Wilmington in our schools. Secondly, we have the Democratic sit-in for common sense gun legislation… Going on 24 hours, this is amazing stuff. We’ve had sit ins before, and the same outrages being social media’d regarding Paul Ryan, also took place when it was Republicans protesting and Democrats controlled the House… The Democrats even turned off the lights; the Republicans have not gone so far yet…. But this is destroying the Republican Party… Seriously, it is a wonder if it will be around November 11th. We have Democrats demanding a vote on gun laws that will save lives… They may not win the vote, (there are a lot of Republicans) but they are demanding a vote… Obviously the Republicans don’t want a vote which will cause them to get attacked by both sides… I mean,… who wants to be attacked by both sides? But unfortunately, I wasn’t able to pay attention to either of these… Today (yesterday) was the Brexit Vote. Most of you don’t know what that is or what any implications of that might be… Let us say: global economic collapse. Remember it was the collapse of Lehmann Brothers, one single firm, that triggered the Depression (falsely called a Recession) of 2008. So before you go in to work today, pour yourself a glass and raise it to “Yesterday”: a normal day that may be the last normal day you’ll remember for the rest of your life. 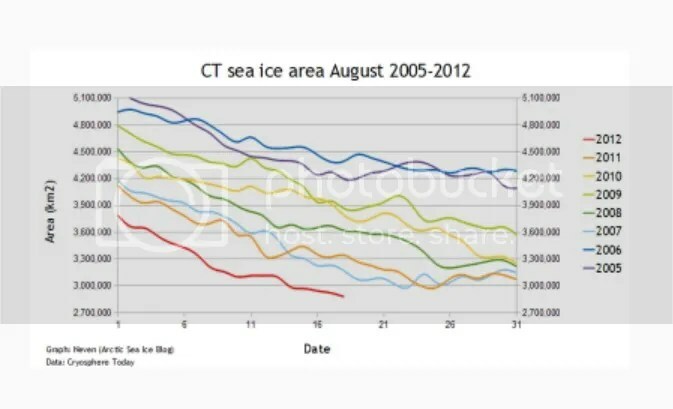 Amazingly Close Battle On Climate Change….. In one of the last places one would expect to hear about climate change and about large oil companies’ denial that is it caused by their carbon extraction, at the stockholders’ meeting for Exxon-Mobile and for Chevron, repeated attempts were made to have their own companies face up to the problem they created, denied, and lobbied to have swept under the carpet…. More than 38% of Exxon’s investors rebelled against the company by voting for a proposal that would have required the company to publish an annual study of how its profits may be affected by public climate change policies, following the Paris climate agreement, to limit the global temperature rise to less than 2C (3.6F)…. Exxo tried to block the resolution from being heard at its meeting, but the US Securities and Exchange Commission regulator ruled that it must include the resolution among Wednesday’s votes. Obviously this revolt could not have happened during a Republican’s executive administration. Rex Tillerson, the boss of oil giant ExxonMobil, said cutting oil production was “not acceptable for humanity”…Tillerson said Exxon had invested $7bn in green technology, but the science and technology had not yet achieved the breakthroughs needed to compete with fossil fuels. The resolution discussed at Exxon’s annual meeting in Dallas was proposed by the New York state comptroller, a trustee of the New York State Common Retirement Fund, the third largest US pension fund, and the Church of England. More than 30 of Exxon’s largest shareholders, including the pension funds of the governments of Norway, Canada and California, Legal & General Investment Management and Schroder’s, previously publicly stated they would vote in favor of the motion. Other supporters of the motion include the pension funds of local authority workers in Greater Manchester and Tyne & Wear. Exxon is currently under investigation by New York’s attorney general over claims that it lied to the public and shareholders about the risks of climate change…. Exxon believes oil and gas will still provide about 60% of the world’s energy demands by 2040. In fighting off the proposals, Rex Tillerson, the boss of oil giant ExxonMobil, played his hand as to the real reason Exxon-Mobile and other oil producers are “pretending” Global warming is still a hoax. He stated their tapped and untapped underground oil reserves already firmly in their possession would be worthless, if the world shifts over to renewable energy. They miscalculated the future; those investments are nothing but a bad business decision. America has always had it’s fringe. There has always been a backlash against populist presidents. There were those who hated William Jennings Bryan (almost President). Go figure. There were those who predicted the end of America with the election of Andrew Jackson… Yeah, we know the kind. However, we must remember that if no one wanted to search out that back-in-the-holler hillbilly, we wouldn’t be hearing his words. So who is the money, funding this apparatus and why are they so intent on bashing this president….. It could be for policies like this….. Under the U.S. Internal Revenue Code, non-U.S. persons generally are subject to a tax of 30 percent on dividends paid on U.S. equities. Currently, many non-U.S. investors, including foreign hedge funds, enter into swaps or other derivative contracts that pay dividend equivalents, instead of directly holding the dividend-paying equities on which they are based. These foreign investors are therefore able to avoid the U.S. tax on a dividend by receiving instead a dividend equivalent, which is not currently subject to U.S. tax. Treasury’s proposed regulations under section 871(m) would align the taxation of dividend equivalents with the taxation of dividends from sources within the United States when the underlying security that generates the dividend equivalent is a U.S. equity. Put simply, when finalized, the new rules will eliminate the incentive for non-U.S. persons to use financial products like swap transactions, forwards and futures to escape U.S. tax obligations. Currently all the gains received by foreign investors in our national stock market that as boomed 20% since higher taxes kicked in last January,… are tax free…. but only if you are a foreign. If you are American you pay the full price…. None of this gets translated down to normal Americans holding mutual funds. But it is very relevant to those foreign interests with huge assets in American banks and markets. For as much as one day’s profits, they could spend the entire budget of every election in the United States…. Their money is why those, in any way connected to the financial world, are into bashing Obama…. Doesn’t it makes sense for you and me and all other domestic stock owners to pay the same tax as do foreign investors, and not an infinite amount more? Each cruise Missile costs $1.5 million. In Libya, we fired 221; 110 in the opening salvo. Alone, that totals to $331 million. B-2 Bombers’ fuel costs $60,000 per hour… They travel from Missouri 18 hours there, and 18 hours back… so 36 hours times $60,000 is $2.16 million for each bomber’s fuel on each run. Weekly costs for a carrier strike force… $25 million in normal operations. In combat mode, the cost rise to $40 million due to extensive flying, and fuel for the planes. Exhibit A: Saudis have put ”on the table” their offer to pay for the entire US assault on Syria. Oil, at $150 a day, has China very worried. The global economy may take quite a hit on the chin. An old American was reprocessing his old studies of Brezhnev-Soviet-Military thinking and brought back interesting points of discussion that directly relate to Syria. “In wars between the people and a regime of extreme reaction…both communists and non-communists united to fight the dictatorship, with each group hoping later to establish its preferred form of government (dictatorship of the proletariat or republican democracy). In these conflicts, once the dictator was overthrown, the Soviets knew they eventually had the upper hand because their supported group had outside support, whereas the moderates would be (abandoned by the United States who had been propping up the dictator) forced to fend for themselves. With all factors being equal, the extra force could make a minority within the initial revolt, grab power after all was done. Back then, it was America supporting the regimes of extreme reaction; the Soviets were seen the revolutionaries. Today it is Russia and Iran, who support these dictatorial regimes, and moderates and a few islamists who are those engaged in making change. The lesson taught was that once Assad falls, without America’s strong continued support of the moderates, the otherwise strong support of Saudi’s Sunnis behind the Islamists will tip the balance to their favor. For as in the past, when moderates took on an American supported regime of extreme reaction, and the communists joined in the fight, it became viewed as part of the bipolar tug of war between the Communists and Capitalistic USA. Therefore even though the moderates usually far outnumbered the splinter cells of Communists, because the ending conflict was deemed a Soviet victory over the US, the communists had tremendous clout and enough support to take over power. This certainly makes Syria clear. In their battle against Assad, the Islamists supported by the Radical Sunni movements are few in number compared to the moderates who want a democratic republic after Assad leaves. If Assad gets pushed out, the Islamists because of their unlimited funding and support can push themselves into power quickly, meanwhile the moderates sit around and try to figure out their next step. In that vacuum the organized faction always wins. The US then as now, could prevent this from happening by throwing its weight behind the moderates after the dictator is removed by being a counterbalancing force. Our success in Western Europe after the Second World War by doing just that, never translated itself afterwards over to East Asia, Africa, or Central America. Instead of immediately inserting ourselves as a civilian presence when moderates and radicals toppled a regime, we sat on our hands, and only later would then send military hardware in our feeble attempt to contain the outbreak our own inaction created. The lesson for the US is that we really need to not focus so much first on the war itself and then immediately extricate ourselves after the conflict when we are needed most, but we actually we need to use our debacle in Iraq as a self-taught lesson to create a civilian team we can move in at a moment’s notice with all the backing and assistance exhibited by the Marshall Plan, to quickly mend broken services, return to normalcy, and stifle the unrest that allows civil wars to fester and continue among both factions of winners long after the regime of extreme reaction is overthrown. We need to focus on reacting immediately with ways to get a nation quickly back on its own feet as soon as the Dictator is disposed. Our opponents of 40 years ago figured this out. If we can learn this, that may be the most valuable legacy the Brezhnev era can ever pass on to us. 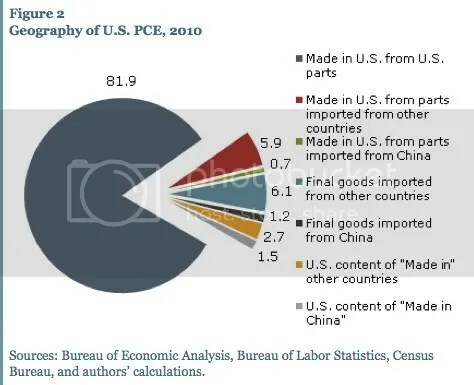 If you were asked out of the blue, how much of what the US consumer spends, comes from China, which of these would you guess… 95%, 80%, or 65%? The answer will shock you.. The real amount was 2.7% and even out of that, 1.5% still went to the US…leaving only 1.2% spent on actual goods imported from China. Meaning, when you pay $70 for Nike sneakers, part of that money goes to Nike USA, part of that to Wal*mart USA, part of that to the US shipping company that delivered the product, part of that to US custom fees and taxes if applicable…. Because Wal-Mart’s $260 billion in U.S. revenue isn’t exactly reflective of America’s $14.5 trillion economy. Wal-Mart might sell a broad range of knickknacks, many of which are made in China, but the vast majority of what Americans spend their money on is not knickknacks. For my geek friends, here is an interesting chart…….